The offer is addressed to groups from nursery schools. It includes theoretical classes devoted to ecology, science and culture. The theoretical classes are accompanied with outdoor activities, including a visit at a small-scale hydro power plant and a trip to the beaver lodges. Those classes aim at teaching the children to have good relationship with nature as well as stimulating ecological sensitivity and awareness. As a result the participants acquire knowledge in the field of renewable energy sources, environmental protection and shaping pro-ecological attitudes. The first part of the workshop is to introduce children to the importance of small-scale hydro power plants as renewable sources thanks to which the electricity is produced as well as a “technical open-air museum”. During the multimedia presentation, the children learn about the importance of water for humans and the environment, they get acquainted with the process of electricity production in small-scale hydro power plants and they realise the need to save electricity. Additionally, they get acknowledged with the nature of small-scale hydro power plants as places of monuments of industry and technology, which are the heritage of technical culture. Finally, the participants will visit the small-scale hydro power plant accompanied by trained personnel. The further part of the workshop will familiarise the children with life and habits of beavers. 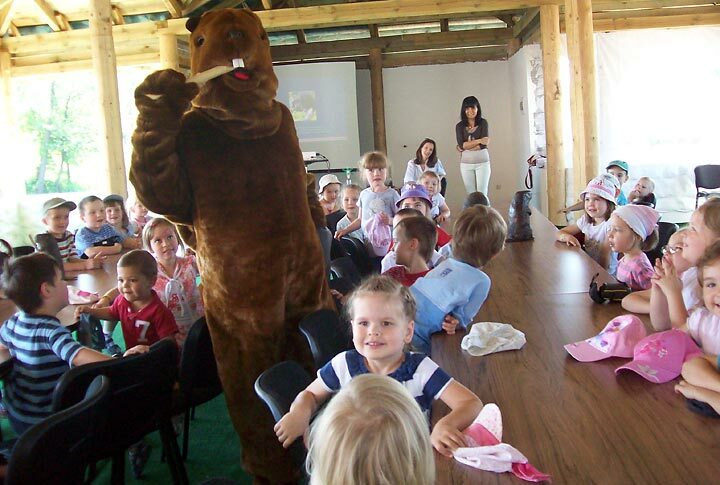 The aim is to show the children the importance of a beaver in the nature and that not only the people contribute to changes in the environment. The children will also see on the example of beaver dams that the animals also create objects having the same functions as those of humans. The multimedia presentation is combined with a trip to the beaver lodges (about 500 meters away). At the end of the course, each participant will obtain a certificate of participation in the workshops, which will remind the importance of renewable energy sources and the need to protect the environment. The ecological workshops last approx. 90 min. The cost amounts to PLN 22 for a participant. The price includes a multimedia presentation, walking tour to beaver lodges, guided tour in the small-scale hydro power plant, certificate for each participant. At the request, we can prepare a meal, either in form of sweet snacks, or a warm dinner with special menu for children. The group should amount to 20-40 persons. The classes are conducted in the “Bobrowy Dwór”. The guest house has full dining facilities and accommodation. The immediate vicinity of a small-scale hydro power plant and a minor distance from the site of beaver activity guarantees to ensure the smooth visit and maintain security throughout the duration of the workshop. On request it is possible to organise sport and recreational activities. In order to discuss the details feel free to contact us by phone or e-mail.